No fuss, no delay, these Quick Salads will be ready before you can spell q-u-i-c-k! Just keep some chopped veggies, fruits and beans handy in your fridge, so you can swiftly toss them up with readily-available seasonings and masalas like chaat masala, pepper, cumin powder, etc., to make delightful options like the Beetroot and Dill Salad and the Masala Mixed Sprouts with Coconut. Beetroot and Dill Salad : Two unusual ingredients, beetroot and dill, complement each other in this salad. Sprouted methi seeds add to the vitamin C, B complex, Iron and Calcium content and help keep a Healthy Heart. Calcium laden fresh bean sprouts in a spicy dressing. Bean sprouts and capsicum together also lend enough vitamin c to this salad which aids in enhancing calcium absorption. Generously loaded with vitamin B2 (Riboflavin), Spinach and Paneer Salad is a great everyday as well as party fare. Just ensure to use fresh low-fat paneer to enjoy its true flavours. Fresh cucumber and tomatoes in a sweet sour dressing with crunchy peanuts. An interesting combination of textures blended with a tangy dressing. For a healthier option, replace low fat paneer with tofu (soya paneer), which contains beneficial phytonutrients like 'genistein' and 'isoflavones' that lower blood cholesterol levels and remove fatty deposits from the arteries. Vitamin C rich veggies like lettuce, capsicum,tomatoes and cucumber tossed together with an Italian basil dressing. But dress this salad just before serving to prevent the loss of vitamin C due to exposure of air. I like all your salad recepie. I am always make salad from your recepie. My family members love all salad made by me but it''s credit goes to you kem. Thanks for share your recepie with us. 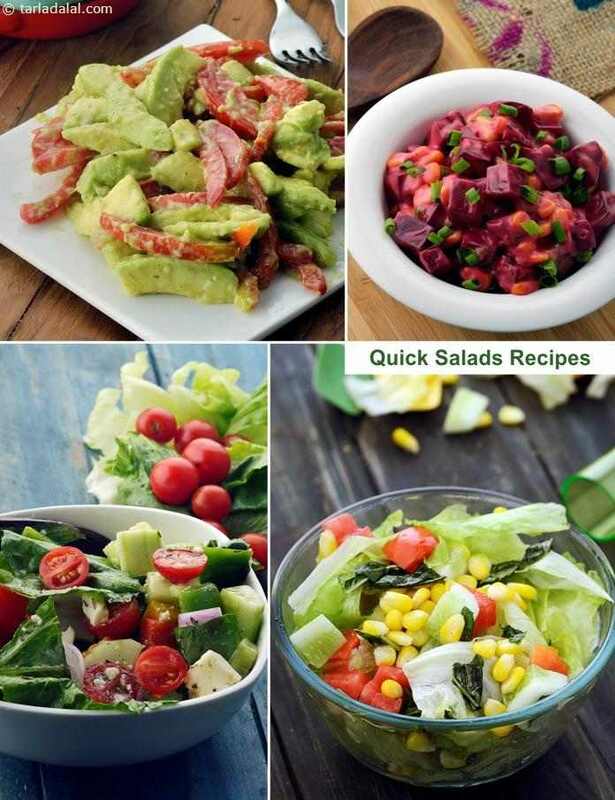 Love your collection of veg salads which are quick and easy to make. We make the cabbage salad often. Tarla Dalal Thanks Deepa for your feedback. Happy cooking. Tarla Dalal Thanks Sundar for your feedback. Happy cooking.